Nothing can break the bond between sisters ... When Beatrice gets a frantic call in the middle of Sunday lunch to say that her younger sister, Tess, is missing, she boards the first flight home to London. But as she learns about the circumstances surrounding her sister's disappearance, she is stunned to discover how little she actually knows of her sister's life - and unprepared for the terrifying truths she must now face. The police, Beatrice's fiance and even their mother accept they have lost Tess but Beatrice refuses to give up on her. So she embarks on a dangerous journey to discover the truth, no matter the cost. 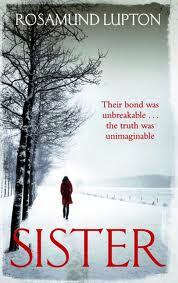 Back in January, I read Rosamund Lupton's Afterwards, which I absolutely loved and couldn't put down so I was keen to read her previous novel, Sister. It's taken me a while to get round to it but it was worth the wait. I started the book on a Thursday and stayed up until 1.30 Friday night/Saturday morning to finish it. Beatrice is living in New York with her fiance, Todd, when she receives the phone call from her mother, telling her that her younger sister is missing. Beatrice rushes back to London where her sister's disappearance soon turns into a murder enquiry. Who would want to kill Tess and why? There are many suspects as Beatrice tries to unravel the mystery of her sister's murder and the reader is kept guessing as more information comes to light. I didn't guess 'who did it'. My approach was to suspect everybody! The intrigue and twists kept coming right until the very end. I didn't see the ending coming at all but everything slotted into place and made sense. My final word on Sister is very simple: wow.